Please arrive at SunTrust Plaza, 303 Peachtree Ave., Atlanta, GA 30308 by 5:30pm to get straight into the activities. The Jam is located on the lowest level. Go down the hill to Peachtree Center Ave. and enter by Morton’s Steakhouse (across from Big Kahuna). If you arrive after 6:00pm, you’ll miss Toolkit bingo and Monica Tisminesky’s Introduction to Service Design. But you can still get in using the intercom. Please tell the security staff that you are with the Atlanta Service Jam in the Suntrust Accelerator Studio. They will ask for your name, so make sure it is on the list! Sparks Grove, one of our title sponsors and long-term supporter of the Atlanta Service Jam recently posted this recap of the 2017 event with a great accompanying video featuring some of our speakers and mentors. Check out their blog post to see if you can spot yourself making a cameo appearance or what you missed and can expect at our next events coming up this year. Turn up, eat lots of food, smile a lot, get to know people, listen and learn. Easy! Start by downloading the Jam Overview document and refer back to it for key info, details, and schedule. Next, head over to http://planet.globalservicejam.org and register as a Jammer for the Atlanta Jam. This is great for us to see who is here and to get yourself out there on the global stage. You’ll also need to upload your projects along the way so there’s a record of your awesomeness! You should be working towards refining and testing your concept throughout the day so keep track of your work by using sticky notes, making drawings, building prototypes, and even the occasional document. You can download the service design tools as a reminder if you need them. Remember to post share your work and show the world what you’re getting up to. Use the hashtags #Atlanta #GSJam whenever you post about the Jam. We’ll be going to dinner at Takorea in the evening, let us know if you’d like to join for some food and maybe a few drinks. I think they call it networking or something? It’s time to pull everything together. Go to the Google Drive for documents and templates. We have a file in the Drive to help you build a process book. Add your own photos and notes to capture the great work you’ve put in over the weekend. We’ll showcase these on our site after the event. Make sure you’re registered on http://planet.globalservicejam.org then upload your process book to share with with the global community. It’s not too late to register for your ticket here and see them in action. The recently renamed Georgia Tech College of Design (previously College of Architecture) will be the venue for Atlanta Service Jam 2017. It is walkable from Midtown Atlanta (15-20 minutes), or you can ride on the free Tech Trolley from the Midtown MARTA stop. Times and route map here. If you plan to drive there are a number of options. Closest are the metered spots along Brittain Dr NW ($2/hour) or the visitor parking slightly further away on Ferst DR NW (also $2/hour). A full day of parking is $15 at the lot on 5th Street (opposite Barnes & Noble bookstore) and closer to Midtown. This location has the advantage of letting you pay as you go rather than having to guess and pay upfront. More info available here and a map showing the different areas in blue. For Uber or Lyft the address is 246 4th St NW, Atlanta, GA 30313. The Atlanta Service Jam is a non-profit event organized by an informal network of design aficionados who share a common passion for growing the field and practice of service design and customer experience. Atlanta Service Jam relies on the generous support of friends and sponsors to deliver this globally recognized and locally impactful gathering and we are excited to announce IN2 Innovation, InReality, Sparks Grove and Orange Sparkle Ball as our sponsors in 2017! Join professionals and students from all industries in a 48-hour collaborative blitz where interdisciplinary teams design, prototype, and deliver completely new service solutions in a high energy, innovative environment. This is your chance to immerse yourself in new design-thinking and creativity processes, make valuable connections locally and globally, and imagine solutions that could change lives! 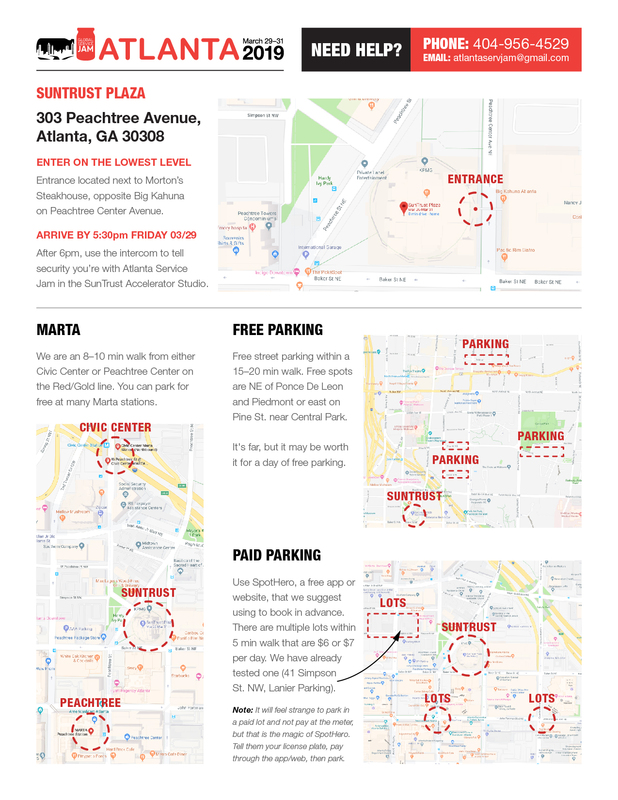 Here’s a short recap of all the fun we had at this year’s Atlanta Service Jam..
To all our Jammers still working hard on their prototypes, please check out this document for final day info.